Mirror, mirror on the wall, catch a burglar once and for all. The spy cam is hidden behind the one way mirror. It can see you, but you can't see the hidden camera. 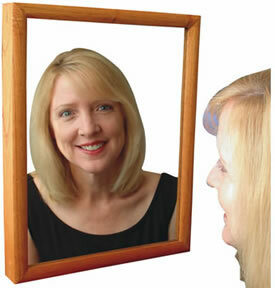 The spy mirror measures 15"(l) x 12"(w) x 2 3/4"(h). This superb, hidden "surveillance" camera comes in a natural wood finish frame or a black frame, and it also features motion-activated recording that starts as soon as motion is detected. With motion-activation, you won't have to fast forward through hours of uneventful footage. DVR is also hidden and records every bit of footage that is in front of the spy mirror. You won't have to worry about getting the video "on tape". You can view your recordings by using the included RCA cable to connect to your TV or computer or insert the SD card into your computer. Free 16GB SD-Card is also included.